James Hayward’s powder horn is today on display in the Acton Memorial Library. On the morning of April 19, 1775, James Hayward made his way from his father’s home in West Acton, Massachusetts to the home of Captain Isaac Davis, commander of the town’s Minute Company. The road along which Davis lived, ironically, is today named not for the bold leader of the Acton Minutemen who actually resided there but for the young schoolmaster. Hayward walked the route not just on that momentous April morning, but nearly every morning on his way to the town’s schoolhouse. Hayward likely arrived at Capt. Davis’s farm around 5 a.m., just around sunrise and about the same time, 13 miles away in Lexington, that the British Regulars reached the Green and fired on the provincial militia there. Hayward was among the first of Acton’s men to report to the captain’s house. But he had no business being there. Hayward had been excused from military service. His foot was crippled as a result of an accident with an axe in his youth. He could have remained home that morning and likely would not have been faulted for it. But he turned out at Davis’s farm nonetheless. Not being a member of the company, he had not been issued the gear that Captain Davis had gone to such great effort to manufacture. Apparently intent on equipping his men as well as British Regulars, Davis, a gunsmith, had issued a bayonet and cartridge box (the latter allowing more rapid fire) to nearly every man in the Minute Company. Rather than a cartridge box with pre-rolled cartridges of powder and ball, Hayward carried with him that morning a hunting powder horn filled with loose gunpowder. That same powder horn would be held up sixty years later by Edward Everett, then a Representative to Congress, later Governor of Massachusetts and U.S. Senator, during an address in Lexington on April 20, 1835. The powder horn had been loaned by James Hayward’s nephew, Stevens Hayward, and conveyed with the story of how the young schoolmaster died. Those gathered marveled at the hole in the powder horn through which, purportedly, the fatal bullet had passed. The monument for which Woodbury so ardently argued is today known as the Isaac Davis monument. The remains of Davis, Hayward and Hosmer were re-interred here in 1851. Many representatives wept right along with him, and Acton got its monument. The same powder horn would be loaned in 1873 to young sculptor Daniel Chester French who had won himself the opportunity to create The Minuteman, a memorial which would be placed at the Old North Bridge, site of the Concord Fight. French (who would crown his career with the statue of Lincoln in the Lincoln Memorial) rode with his father from their home in Concord to Acton to get the powder horn from the Hayward family. Eager to make his Minuteman as authentic as possible, French sought out numerous artifacts from the Concord Fight. James Hayward’s powder horn hung on the wall of French’s studio for several weeks. A representation of it was included in his finished statue. That powder horn, which later became such a powerful symbol, swung at the hip of schoolmaster James Hayward as he marched along with the Acton Minutemen to Concord. Considering he had a crippled foot, we might assume the march to Concord was a difficult one for him. At the Old North Bridge, after much deliberation, the provincial militia and minute companies advanced on the small force of British Regulars holding the bridge. The Acton Minutemen led the column. Capt. 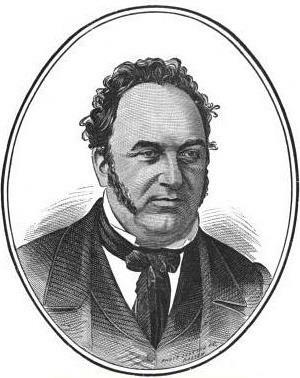 Isaac Davis was killed in the first volley from the Regulars. Without their captain, according to later depositions by Acton Minutemen Thomas Thorp and Solomon Smith, the company devolved into confusion. Most of the men joined in the pursuit of the Regulars, presumably acting more or less on their own. The site where James Hayward allegedly received his mortal wound. The remains of the well are at center, the foundation of the house from which the redcoat emerged are at far left in the background. James Hayward pursued the British column along with his compatriots for a long way, another 6 miles to Fiske Hill in Lexington. 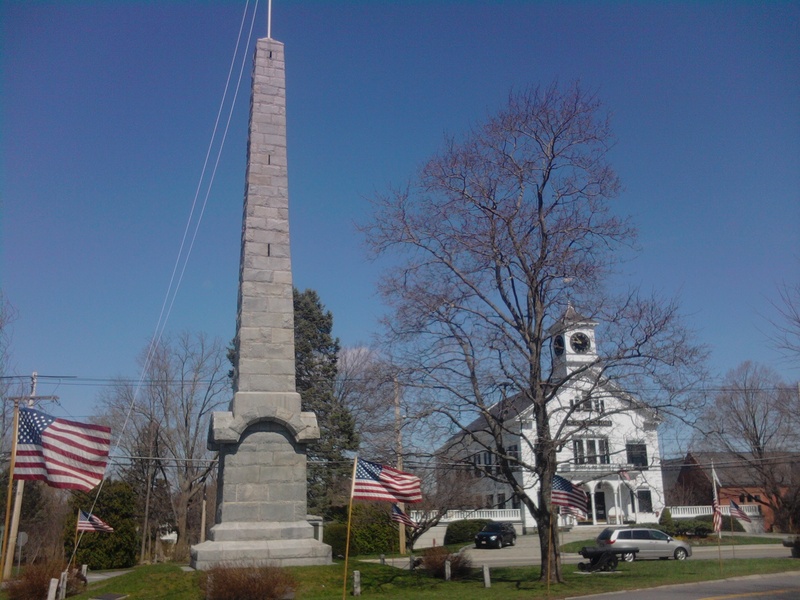 He reached the Ebenezer Fiske House at the peak of the hill after the British column had passed through. The action had left him behind. Perhaps due to his foot. Or perhaps he was simply exhausted. Either way, he found the Fiske farm quiet and abandoned when he reached it. 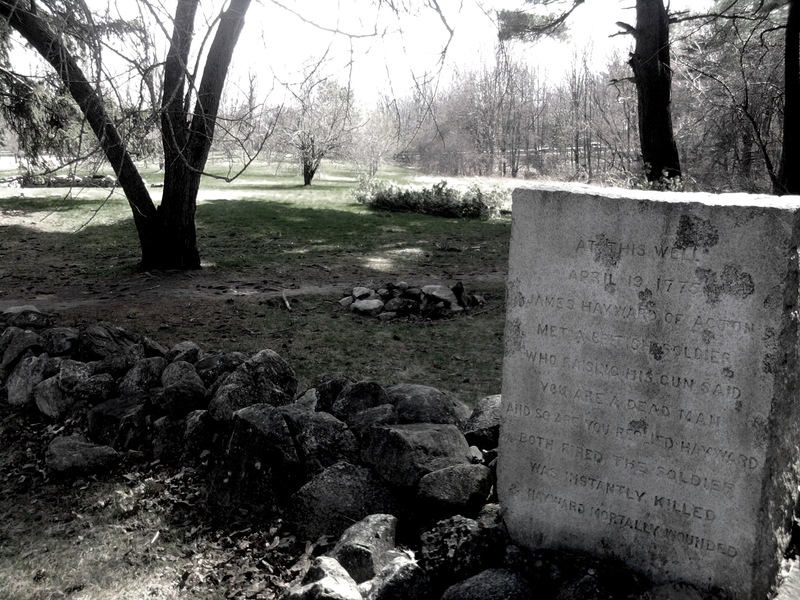 Hayward, evidently seeking a respite, went for the Fiske’s well which sat just off the side of the road. As he did so, a British Regular emerged from Fiske House. The two, redcoat and provincial, aimed their muskets at one another. The British soldier said, “You’re a dead man.” Hayward replied, “So are you.” And the two fired simultaneously. At least, this is the story as well-intentioned Rev. James T. Woodbury told it in 1851 beneath the dome of the State House. And it is fundamentally the same tale related by Everett in 1835…although he did not include the dialogue nor the level of detail that Woodbury later would. It might be noted that Everett was encouraged to tell the tale by both Hayward’s nephew and by Rev. James Woodbury. I think it safe to say that Woodbury, inspired by the strong oral tradition within the Hayward family, was the first promoter of James Hayward’s story. And the details have been printed and reprinted, just as Woodbury told them, in nearly every book about the Battle of Concord and Lexington ever since. It is one of those anecdotes that is so compelling that it begs to be repeated. And it gets a bit more dramatic. 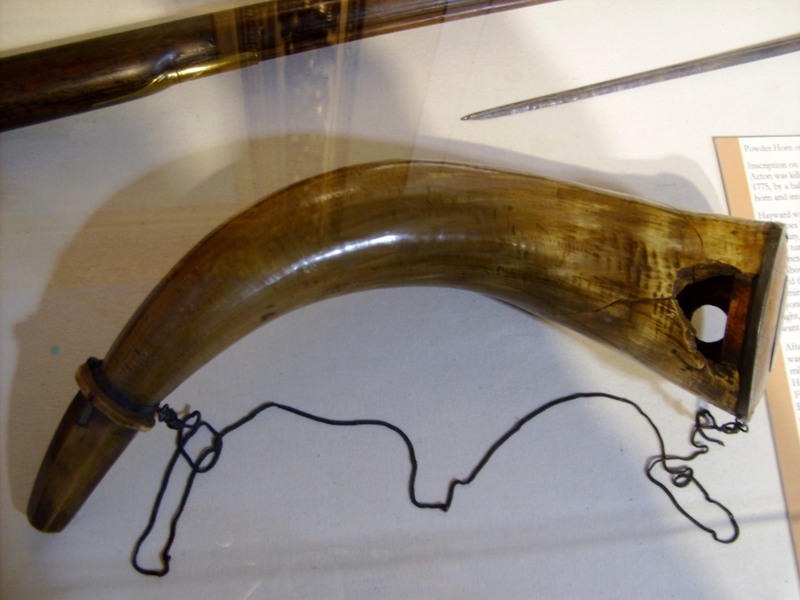 According to Woodbury’s account, the ball that pierced Hayward’s powder horn went through his side. He fell near the Regular but unlike his opponent, who was killed instantly, Hayward survived another eight painful hours. He was eventually discovered and his father, Deacon Samuel Hayward was soon at his side. His father told James that he was mortally wounded and asked him if he was sorry he turned out. Leaving aside for the moment the obvious (and intentional) sentimentality of Woodbury’s account, when one considers the circumstances of Hayward’s death, there are aspects of the story (again, so very frequently retold) that are difficult to accept. It seems unlikely that we could know what the redcoat and Hayward said to one another when they were, apparently, alone. The addition of the unnamed sweetheart is just a bit too perfect. I have always had trouble with the hole through the powder horn. Not that I doubt the authenticity of the object…but that perfectly placed bullet hole. And, getting back to the sentimentality, James’s alleged words are so typical of the 19th century version of a good soldier’s death (see Drew Gilpin Faust’s Republic of Suffering). There are no primary sources about the life and death of James Hayward. The story we have is related by Rev. James Woodbury as he, allegedly, heard it from James Hayward’s brother and nephew. It seems Woodbury was quite close to both of them. And this might count for something. It could be that Deacon Hayward, upon finding his son (which is in the realm of possibility) was told the circumstances of James’s mortal wound by James himself and the Deacon passed those details, along with the gist of James’s words, to his family. But then again, perhaps it did not happen at all how Woodbury described. It may seem that by deconstructing the story of James Hayward’s death, I am trying to somehow to diminish his importance. Quiet the contrary, I feel it is the perpetuation of romantic folklore surrounding brave individuals that diminishes their true importance. When I think of the most basic elements of the tale, those simple facts that we can accept as true, I am inspired by James Hayward’s story. He overcame physical challenges, fought and died, not because he had to go, but because he chose to go. Be calm, and sink into His will.